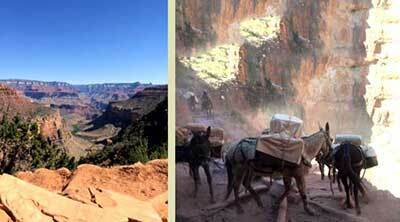 My husband, Kevin, myself and my two boys just returned from the Grand Canyon. I had wanted to go for years. Pictures of the canyon do not do it justice—it is more spectacular than I ever imagined. Its grandness confirms the power and beauty of nature. We hiked the canyon, and needless to say, with two teenage boys and an athletic husband, I was the rate limiting factor. I could hardly make it back up, but I did, and I look back and can not believe I did what I did. I feel I came out stronger for the experience of pushing myself. You learn more about yourself when you are pushed to the limit! The relationship with nature and our family started 20-years ago when Kevin and I went on safari in Kenya for our honeymoon. It was so picturesque and left a lifelong impression on us. We saw nature—how it had been for thousands of years. Since then we have taken several trips to a hot springs in Mexico with locally grown, organic, homemade food that feeds your soul. I have never tasted food so good. Hot springs are rich in minerals that begin to relax your body in only 5-minutes of soaking. Time slows down and ideas come to surface that had been blocked by the busy day-to-day existence. All of our “back to nature” trips involve hiking. We have taken day trips to Starved Rock State Park at least once a year—breathing in fresh air and getting away from the hustle and bustle of daily life. Other adventures included a couple of Seattle, Washington trips to national and state parks, as well as Mount Reiner—all involving the great outdoors. All these getting “back to nature” vacations help us to clear the mind, relax and return to what is important by being with our family without distractions. We always return closer as a family and happy to have gone—even with some initial protests about leaving friends etc. With our busy lives, I think it’s important to plan trips that are less consumer orientated. We care more about the simple, natural experience—deeply connecting us to each other and the meaning and purpose of life. There is no denying the powerful connection between humans and nature. Consider making a connection with nature on your next vacation. It will be far more memorable with an experience attached to it.